Orchid Detective; Why Won't My Plant's Roots Stay in the Pot? Many orchid hobbyists are frustrated by orchids that send their newest roots into an adjacent pot instead of their own which contains the exact same medium. Maybe your orchids wondering roots are trying to tell you something? Generally, plants allocate energy to grow new roots only when they are not getting enough water or nutrients. The one exception to this generalization occurs in epiphytes, i.e. plants that grow attached to trees or rocks, including epiphytic orchids. Epiphytes have one additional demand of their roots; to keep the orchid from falling from the tree or rock where it germinated. Epiphytes need to remain attached to something solid. While aerial roots can also take up water and nutrients, their primary purpose is to keep the orchid from falling from its perch. Aerial roots are generally thinner than roots in the pot and, once attached, may become flattened to provide more attachment surface area. These roots will become soft and green when they have been continually wet for 10 minutes or so. Only in that condition will they absorb water. Orchids grown in very open media or mounted require prolonged soaking before their roots will be capable of absorbing water and nutrients. There are some orchid species that do not have leaves, but obtain their energy from chlorophyll in their roots. One large Angraecum in my collection that was getting relatively tall for its pot was repotted last year and moved to a step bench. Where the orchid was close to the wood backing of the bench, new roots quickly emerged from the stem and grew laterally, directly toward the back of the bench. Roots emerging on the more lighted side of the Angraecum grew directly down into the lava rock in the pot. New roots were responding to the swaying of the orchid in the pot and trying to attach to a firm surface. Roots that attached to the back of the bench flattened and remained hard, while those that penetrated into the pot became more thickened and soft below the surface. Remember that wandering roots are the orchid’s response to “insecurity” and do not require psychiatric help. This is more normal for some orchid groups than others, but is common. When this phenomenon is observed in orchids that appear secure in their pots there may be another cause, typically a sour or decomposing medium. Your orchid is looking for water and nutrients elsewhere because the medium has become too acidic and/or the orchid’s roots have died. If you notice this on a plant that should have a good root system, gently lift the plant to be sure it has a good root system and check the medium in which it is potted. That should tell you if there is a problem. Then there are species, clones, or hybrids that are more prone to this than others and will do the same thing in all media and to all growers. In phals, the tendency seems to be noteworthy in hybrids with large doses of Doritis pulcherimma. 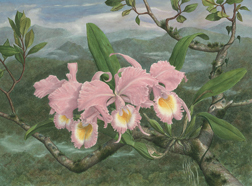 Note that this species will soon be listed as a member of the Phalaenopsis thanks to Christensen’s revision of the genus. Thus, in lists of orchid hybrids there will soon be no Doritanopsis hybrids, only Phalaenopsis. This month marks the beginning of a new chapter in my orchid growing, but one I and many of you have experienced before; moving! My orchids are tired of long winter nights and yearn for life in the tropics so we are moving there, “almost”. Expect to be hearing about the joy of building permits, moving shock, learning to grow with new water, etc as I learn to grow orchids all over again.